Looking for furniture in Cheshire? If you reside in Cheshire and are within easy reach of our store or are visiting the area you should have no difficulty in finding us. Nantwich is accessable by train, bus and car and with the aid of Google maps you can use the latest technology to pinpoint our location. You can also use the Google postcode search under the map to give you full route finder information. We have a free customer carpark at the rear of the store in Barker Street as illustrated on the other map. 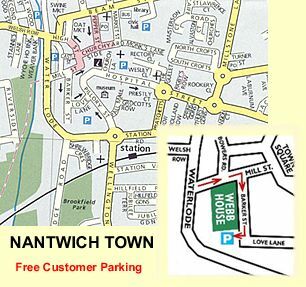 If you want to explore the historic town of Nantwich there is quite a bit of information below. 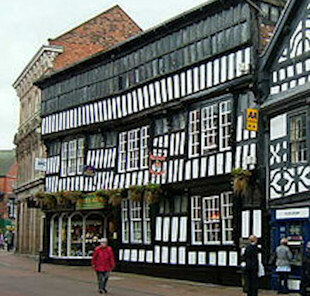 Nantwich has the largest collection of historic buildings outside Chester in the county. According to the 2001 census the urban area had a population of 12,515. The listed buildings are clustered particularly in the town centre on Barker Street, Beam Street, Churchyard Side, High Street and Hospital Street,and extending across the Weaver on Welsh Row. The great majority are located within the 38 hectares (94 acres) of conservation area, which broadly follows the boundaries of the late medieval and early post-medieval town. 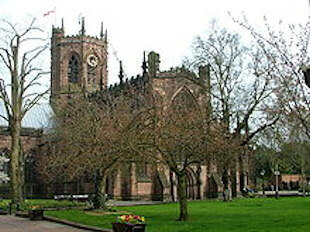 The oldest listed building is St Mary's Church, which dates from the 14th century and is listed at grade I. Two other listed buildings are known to pre-date the fire of 1583: Sweetbriar Hall and the grade-I-listed Churche's Mansion are both timber-framed, black and white Elizabethan mansion houses. A few years after the fire, William Camden described Nantwich as the best built town in the county, and particularly fine examples of timber-framed buildings constructed during the town's rebuilding include 46 High Street and the grade-I-listed Crown coaching inn. The town contains many Georgian town houses; good examples include Dysart Buildings, 9 Mill Street, Townwell House and 83 Welsh Row. Several examples of Victorian corporate architecture are listed, including the former District Bank by Alfred Waterhouse. The most recent listed building is 1–5 Pillory Street, a curved corner block in 17th-century French style which dates from 1911. The majority of the town's listed buildings were originally residential; churches, chapels, public houses, schools, banks, almshouses and workhouses are also well represented. Unusual listed structures include a mounting block, twelve cast-iron bollards, a stone gateway, two garden walls and a summerhouse. Dorfold Hall is a Jacobean mansion in the nearby village of Acton. 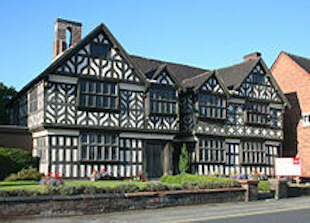 It is listed at grade I, and was considered by Pevsner to be one of the two finest Jacobean houses in Cheshire. Nantwich Show, including the International Cheese Awards, takes place in the hall's grounds each summer. Nantwich Museum is on Pillory Street. It has galleries on the history of the town, including Roman salt making, Tudor Nantwich's Great Fire, the Civil War Battle of Nantwich 1644 (Battle of Nantwich is still an annual event in Nantwich). Hack Green Secret Nuclear Bunker, based a few miles outside the town, is a former government-owned nuclear bunker located in the village of Hack Green which is now a museum. The 82-seat Nantwich Players Theatre is on Pillory Street in the centre of town. It puts on around five plays each year. Nearby, Crewe is a railway town within the unitary authority area of Cheshire East and the ceremonial county of Cheshire, England. According to the 2001 census the urban area had a population of 67,683. Crewe is perhaps best known as a large railway junction and home to Crewe Works, for many years a major railway engineering facility for manufacturing and overhauling locomotives, but now much reduced in size. From 1946 until 2002 it was also the home of Rolls-Royce motor car production. The Pyms Lane factory on the west of the town now produces Bentley motor cars exclusively.